At the end of April 1992 Los Angeles burned for six days as large sections of the population rioted, following the acquittal of LAPD officers who were on trial for the brutal beating of a black man named Rodney King. As law enforcement and other emergency services concentrated their efforts on attending to the riots, the Chicano gangs of Lynwood take advantage of the chaos to settle some old scores. The death of Ernesto Vera – a young man with no connection to the gangs except that his younger brother and sister are members of one of the largest – sparks off an intense period of fighting that goes largely unnoticed by the outside world, and is recounted from the point of view of seventeen of the people – gang members, drug dealers, graffiti artists, nurses, firemen and members of the US Armed Forces – caught up in the events. 60 deaths were attributed to rioting…It is possible, and even likely, that a number of victims not designated as riot related were actually the targets of a sinister combination of opportunity and circumstance. As it happened, 144 hours of lawlessness in a city of nearly 3.6 million people contained within a county of 9.15 million was a long time for scores to be settled. From this seed, the possibility of gangland warfare carried out under cover of much wider disorder and disruption, comes the central premise of Ryan Gattis’ ambitious new novel. Set against the background of the 1992 Los Angeles riots, Gattis tells of the horrific death of Ernesto Vera as he walks home from work on the first evening of the riots, and of the quickly-escalating war that ensues between the gang of which his brother and sister are a member, and their biggest rivals. Gattis pulls no punches as he relates his story and this, coupled with the first-person narratives that he uses, serve to plunge the reader into the midst of the action. All Involved is structured in chronological order, one section of the book for each of the six days of rioting, and is related from seventeen first-person, present tense points of view, beginning with Ernesto Vera himself, who opens proceedings by describing the events leading to his own death. What makes All Involved unique is the fact that each character gets only one chance to speak before the next picks up and continues the story, allowing the reader access to a broad range of narrators. This brings with it a better understanding of the personalities in play, the relationships between the individuals and the gangs, how different people perceive what’s going on, and how they live with what they are doing. While it necessarily leaves some dangling threads, it is impressive how Gattis manages to tell a complete and coherent story without a single re-visit to any of the characters. From the outset, Gattis gets deep into the minds of each of his narrators, and gives each a unique voice, and a unique outlook on life. This feels like a collection of individual testimonies, intersecting stories told in the participants’ own words, with no filter, and no omniscient narrator attempting to plug the gaps or soften the sometimes jarring transition from one voice to the next. These are people who live their lives on either side of the fine line between law and outlaw, and Gattis captures them perfectly, recording the nuances of their speech, the slang and the accents in a way that makes these characters come alive for the reader. The riots themselves remain firmly in the novel’s background, the catalyst for this series of events, but by no means an important part of them. 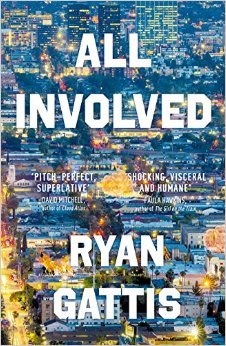 All Involved contains a timely reminder, though, that recent trouble in the likes of Ferguson and Baltimore are not new phenomena, nor is the spark that often ignites the flame – as one character tells us, in Los Angeles alone, there seems to be a thirty-year cycle of racially-motivated rioting. Interestingly, despite who the central characters of this extraordinary novel are, the authorities come off in the worst light, be it the seemingly corrupt policeman, or the Sheriff’s Department’s Vikings, who seem to dole out beatings with impunity, or the cold, callous and anonymous Special Forces soldiers who take their own advantage of the lawlessness to hand out brutal justice of their own. The gang members – or at least the core crew that form around Ernesto Vera’s little sister – come off in the best light, and it is these characters for whom we feel the most sympathy and for whom we find ourselves rooting the most fervently. Got approved for this, and your review’s really made me keen to read it asap. Great review btw.